This being the opening sentence from Conan Doyle’s third SH story about a father masquerading as a short-sighted suitor to deceive his daughter. Which led me to a few idle thoughts about identity and the wearing of badges which are, it seems, some kind of validation of it. I could bang on about hijabs or barcodes bearing 666 in binary at this point, but others have been there before, so, no. I myself am contractually obliged to drape an unflattering, laminated photograph plus emblematic logo around my neck to proclaim my identity to anyone curious enough to peer at it. The children I teach do not, yet for security reasons they are the very ones whose identities should be known with more accuracy than mine. The very act of donning such a tag is a signal of submission. Not of mutual commitment to public safety. To the sceptical, why does no one with actual power wear one? Which chief executive has one on over their suit. In a university, does the chancellor wear one? Hold your breath until the next time Obama appears at a press conference with one on. Of course, the reporters, lower in the food chain, will have them. ID badges, whatever their ostensible purpose, have the effect of segregating those whose dignity is deemed important from those whose is not. There perhaps exist circumstances in which immediate identification of an unknown person’s affiliation outweighs such concerns: in a nuclear weapons facility, perhaps. Or a school playground. Otherwise, do I really wish to know that my waiter’s name is Omar? I hardly think we’re gonna exchange Christmas greetings. 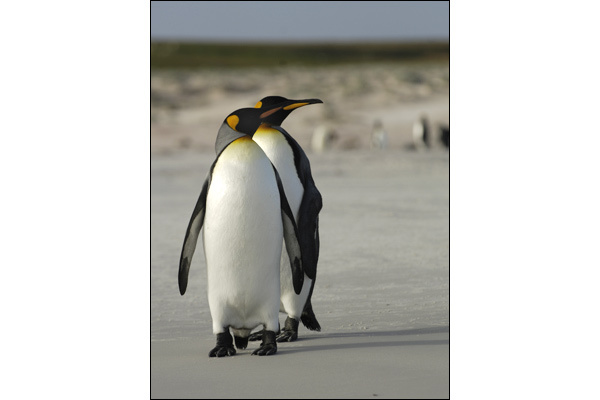 The image is of king penguins in the Falklands, recently making a comeback. Startlingly similar, there’s not an identity tag in sight.